To-be-read blog posts are one of my favourite kind of posts to read because I'm always curious (read: nosy) to see which books are noteworthy enough to make it to the top of someone's pile, and because I always seem to discover a new book that I then in turn add to my 'I need to look into this further' list. And I'm sure I'm not the only one that has a list like that. When it comes to making and sticking to my own to-be-read selection however, well, let's just say I'm not the best. 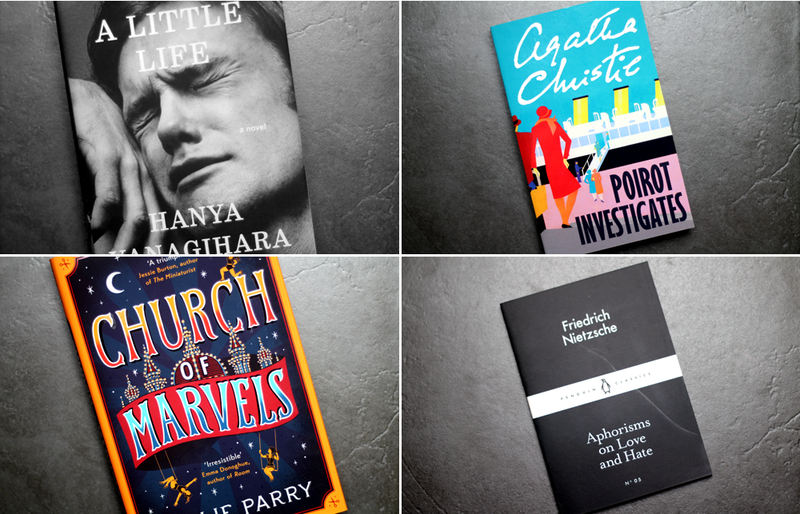 A combination of being an 'I can only read which ever book I'm in just the right mood for at the time' person and just generally very easily distracted, means I can't predict which book I'll want to read next, let alone which books I'll want to read in two weeks time. Even with that being said, I'm going to give it a go this month and we'll see how well I did at the end of the month! The book I'm currently reading, I've talked about it an absurd amount already this week but if it sounds like something you would like/you're willing and able to have your heart broken and beaten to a pulp, I implore you to pick up a copy. The writing is phenomenal. And that's not a word I use lightly. After A Little Life I think I'm going to need something quick and fun to read. I have a collection of Poirot books that I bought from The Book People earlier in the year and this is the second one I'll be picking up. What's even better is that this is a collection of short stories, which I wasn't expecting, but it's a pleasant surprise. There's a story about a film star and a diamond, a suspicious death in a locked gun-room, a jewel robbery by the sea, and so much more. My favourite thing about Christie's work is how everything always slots neatly into place at the end. There's something very satisfying about that. I first started reading this back in May and I put it down, not because I wasn't enjoying it, but because I got a little distracted. 'From the sideshows of Coney Island to the tenements and opium dens of the Lower East Side, to an asylum on Blackwell's Island, follow the adventures of two sisters, an enigmatic orphan, a mortician's bride, an assortment of freaks, and a newborn baby, as they come together in the Church of Marvels...' This is one of those novels that feels like a real treat to read and I'm looking forward to getting lost in late nineteenth century New York again very soon. There's a little collection of these Penguin Little Black Classics on my shelf and I have, shamefully, been neglecting them. An 'iconoclastic German philosopher's blazing maxims on revenge, false pity and the drawbacks of marriage' this is a little book that I'll be making my way through slowly over the coming weeks to get the most out of it, even though it can feel so tempting to simply whiz through. Do you like to pick out a few specific books to read at the start of each month? Some great choices! I always want to read an Agatha Christie book but I have no idea where to start! I love reading these posts, and yet I never write my own. I always jot down the books I'm hoping to read at the start of the month, but I'm terrible at completely ignoring it and reading something different. The Church of Marvels sounds awesome & I love the cover! Adding it to my Goodreads to-read pile.